Who doesn't love a workout that can be done anywhere, requires no equipment, and all you need is your body and a little bit of space! Often workouts get extra complicated when really all we need is our body to move. Movement is the key to all workouts and this one will from Spartan will have you moving! 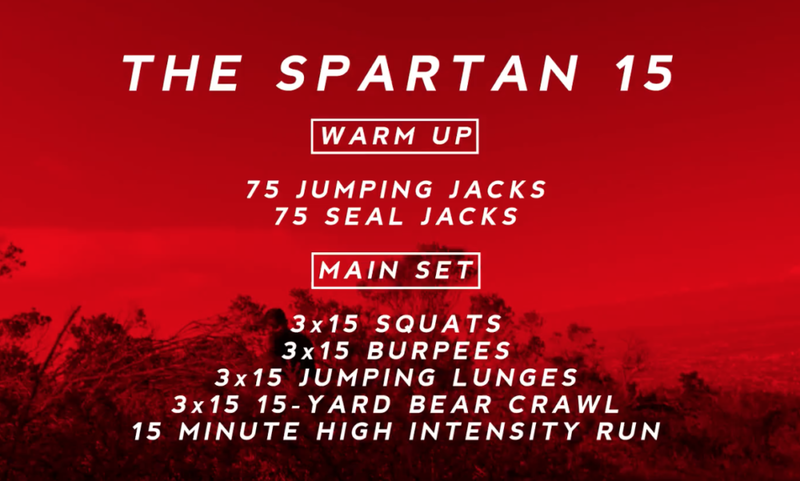 The Spartan 15 Workout includes squats, burpees, jumping lunges, bear crawls, and a high-intensity run. The workout is simple. After a warm-up of 75 jumping jacks and 75 heal jacks, you complete each exercise 15 times for three sets. If you want a bit more of a challenge complete the Spartan 15 at the end of each mile of your run, skip the warm-up and just do the main set each mile. So if you are going for a 5-mile run, that means you will complete the Spartan 15 five times. That will really be a brutal workout. Mix it up, it is your workout. Find what works best for you, and your fitness level. Need more inspiration for your next workout. Be sure to check out our entire training section of Mud Run Guide for more inspiration and workout ideas to prep you for your next obstacle race or mud run. Find a Spartan Race Near You! *This information is meant for informational purposes only. Consult with your doctor before beginning a new workout routine.